Tales from the Den of Chaos: FO Roundup!!! Well, I was getting ready to post about the little vest I worked on all weekend, and suddenly I realized…I totally owe you guys some finished object pictures!! 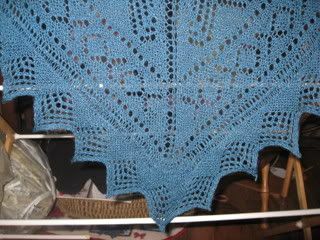 …and then the “oh, wait, I’m not actually ‘almost done’ I’m more like ‘sort of close-ish to done’ knitted-on border. It remains a fun knit. Difficult enough to be interesting, not so difficult that you’re ripping hanks of hair out of your head screaming, “OH MY GAWD, WHY DID I THINK I COULD DO THIS?!? 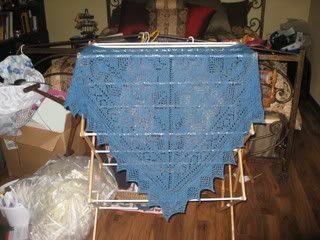 !” It took two skeins of the Gloss Lace, which runs only $4 a skein so, hello, $8 in materials – my kind of project! 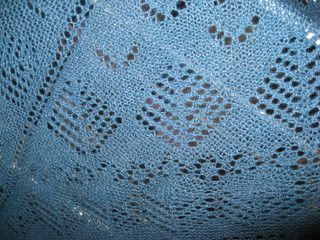 It’s not the kind of yarn where you fall down in a swoon due to its buttery loveliness or amazing hand-dyed splendor, but the project turned out beautifully. It blocked easily, and when you drape it over your shoulders it is both light and yet warm - 70% Merino and 30% Silk. 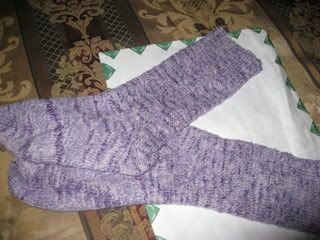 Meanwhile, I finished those Tofutsies socks. 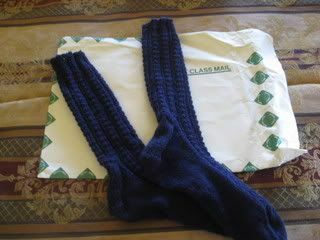 The pattern is from Interweave’s Favorite Socks: 25 Timeless Designs. These are from the same pattern book, the Retro Rib socks. 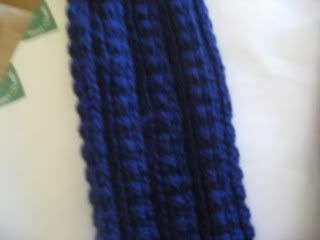 The “rib” pattern is a simple series of purls and k1b, and it creates a sock that is very comfortable. It is a stretchy pattern, so the same number of stitches can make either a man or woman’s sock, but at the same time it hugs the leg nicely and feels like it will stay up (these are going to be a Christmas present, so I’m not actually wearing them…I tried to talk myself into believing that ‘road testing’ should be considered a high level of quality assurance, but couldn’t quite manage to make it stick). I have absolutely no idea what yarn this is. It is sock yarn, without a label. I dug into my Some Assembly Required Sock Drawer looking for a boring man-type color sock yarn, and found two label-less balls of dark navy sock yarn. It's super-soft and feels very high quality, and I think it might be Lang Jawoll...but I just don't know. Love the shawl and the socks. Tofutsies is one of my fave sock yarns, but then I have used so few of the "famous" yarns. The FO's look lovely, Tama. I'll have to look for the book you mentioned as I think the blue socks would be perfect for DH's best friend (who has huge calves with small ankles). I so owe that man some socks! mindboggling. 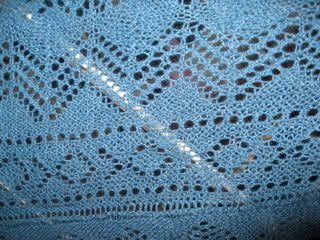 I can't knit 5 rows of k1 p1 without screwing up. Really - I'm pathetic.